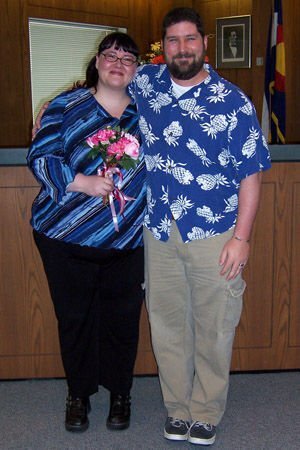 Here is a picture of my husband and I right after we eloped.&bsp; We've been together for 7 years and married for 4.&bsp; Often when we wake up in the morning the first thing he says to me is, "I love you. "&bsp; He's seen me at my best and my worst and has always made me feel loved and adored.&bsp; My weight has never been an issue to him--he constantly tells me how beautiful I am.&bsp; I feel unbelievably lucky every day that he is in my life, and he feels the same way about me. It truly doesn't matter what you look like--love finds a way!